I am honored that you have chosen to get to know me and my counseling process. I believe at the heart of therapy is the relationship between therapist and client. I look forward to being a part of your journey. The possibilities of real and powerful change inspire me to do this work. I enjoy helping my clients heal from their past and take meaningful steps forward into their futures. Before becoming a counselor, I volunteered on the King County Crisis Line for nearly three years, where I worked with individuals going through emotional crisis. I completed my internship and post-graduate experience at Seattle Pacific University's Student Counseling Center. In addition to my private practice, I have been on faculty for the Clinical Mental Health Counseling program at Seattle University, and currently serve on the board of the Seattle Counselors Association. I hold a Masters of Arts Education in Counseling from Seattle University. I am a Licensed Mental Health Counselor in Washington State, as well as a NBCC approved Nationally Certified Counselor. My approach to therapy is person-centered and multicultural, backed by Cognitive Behavior, Psychodynamic, and Trauma Focused theories and techniques. I have certification in Lifespan Integration, and often incorporate that into my therapy when appropriate. I tailor my techniques to the unique needs of each client with a holistic approach to counseling focusing on mind, body and spirit. Non-Judgment - Each person has a unique and powerful story. No matter how "wrong" you feel your life may be now, it makes sense given what life has brought you. I take the time to explore your story and get to know you deeply with positive regard and without judgment. Genuine Empathy - You are not alone. Genuine empathy for me means taking the time to fully understand you, walking along side you throughout your journey. Having someone to witness and understand you is the only way out of shame. Dedication - I value our therapeutic relationship as a unique and safe place where you can fully explore who you are. Because I believe the therapeutic relationship is so special, I make our time together a high priority. Hope - It is my hope that through therapy we will co-create the insight and skills to find peaceful resolution, discover inner strengths, and empower healthy and meaningful life choices. My dog Frasier often is with me in the office. 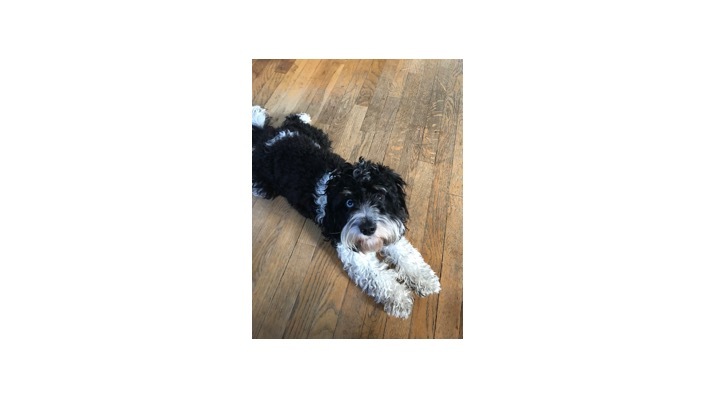 He is a hypoallergenic Cavalier King Charles Spaniel/Poodle mix with lots of love and personality. If you prefer Frasier not interact with you please let me know before your appointment.